I thought I'd share some of the things I've read in June that were worthwhile along with various fun finds. Feel free to check out these resources if you get a chance. Alone Yet Not Alone by Tracy Leininger Craven- This book is based on German immigrants by the name Leininger who settled in Pennsylvania. Life was hard but good until the French-Indian War hit their region. This family of faith relies on God and each other to make it through. It's an easy book to read that I read aloud to my children. They enjoyed the story line while also learning a valuable piece of history. Even more, it captures the truth that God never leaves us nor forsakes us. The family realized that they are truly never alone. Throughout there are colorful pictures from the movie being released to DVD later on this year. I highly recommend owning a copy of this book in your library if you have children. 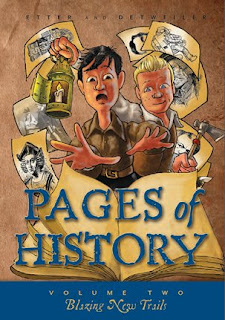 Pages of History Volume 2: Blazing New Trails by Bruce Etter. This is another read aloud I've been doing with our family in the evenings this past month. It is full of rich history of America along with a fun story line of two boys, James and Lance, who travel along with a notebook through time. There are pictures of famous people in the past, maps, and diagrams throughout to help children identify what is being discussed in the story. There is so much good information and all pointing back to God that this makes an excellent history book. We are currently learning American history as a family and we found this to be an excellent resource. I just heard about this foundation that helps children who have been orphaned in Africa by sending them to one of ten villages teaching them about the Bible, giving them an education, and caring for their needs. Like World Vision and Compassion, this foundation relies on support from monthly supporters. You can choose a child who you'd like to support and help them get the care that they need. After what happened in Charleston that evening in the church, I think many people were left with wondering what is going on in our nation for people to still be full of such racism and hate. This blog discusses what believers must do and should do... we need to talk about it. Upon hearing what the Supreme Court's decision was in regards to the definition of marriage, I was left with a lot of wondering about how things will go in the future for Christians. This post talks about what we as parents need to do to move forward. Written by the previous blog posted above, this was something that captured my attention with the title's name. As a mother of six, I've heard the questions and comments from those who think my children don't get enough attention from me. However, what they don't see is that I am with them all day. I play games with them individually and take them places individually as well. We read a lot together and I share all three meals with them each day. That is way more than a lot of people. This article shares a lot of how I feel and how my children feel as well. They love each other and don't feel like they are left with a lack of attention from us parents. I love Jen Hatmaker and her personality. She is an amazing Christian woman who has a great outlook on life. 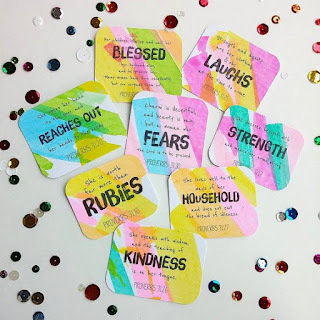 You will love this fun post to read! We've all been there trying to be Super Mom. And we've all been there watching someone who resembles a Super Mom. But should we strive to be an Abiding Mom or a Super Mom. I love the chart that accompanies this post. Whoa, is this one an eye-opener!!! This gives encouragement and hope on the future, despite what the Supreme Court decided for the nation. I loved this line: "The first marriage was between a perfect man and a perfect woman. 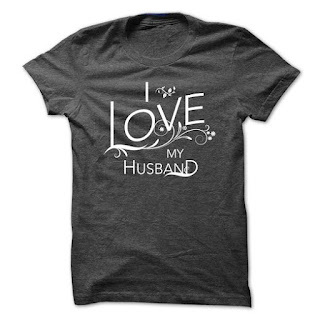 The last marriage will be between a glorified man, the Lord Jesus, and his sanctified bride, the church." Oh, how I've felt this before. You know, the feeling like we aren't doing anything right in our spiritual walk. We feel like we aren't spending enough time with Him thinking we need to be perfect. But we don't need to feel this way. Bambi shares how no matter what kind of thoughts we've had or how we've been acting, we can still come to Him, flawed and imperfect. 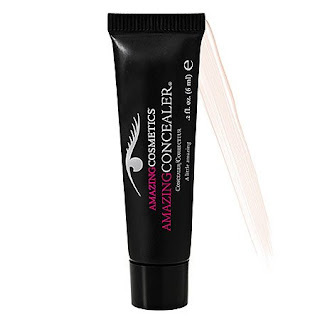 I've been using Amazing Cosmetics Amazing Concealer for probably five years. A small tube lasts forever and I am using it to cover my dark circles nearly every day. It may seem pricey at around $28 for a 0.2 oz container but it really does last a long time. It's the best concealer that I've found so that makes it worth it. You can find this at Sephora or Amazon. This is my favorite song at the moment. Ellie Holcomb wrote it as she was pregnant for her child to remind her that no matter what, she is loved and God will always be there with her. That is the message I hope I get through to my children. You will be amazed at this beautiful arrangement. 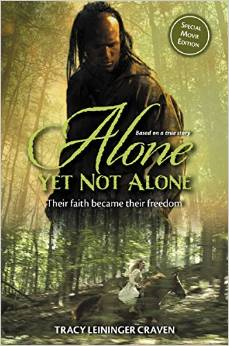 This hymn, Alone Yet Not Alone, goes with the book mentioned above and the release of the movie coming out soon. This is from the previous singer but I love this version as well. It gives me chills every time I hear it as I imagine needing my Savior. This is my favorite hymn and a song I often find myself singing often. I need God every hour. How about you? I remember the day I got the call from the doctor about all of the foods one of my sons was allergic to at the time. The list was extremely long and I didn't even know where to start. We were actually in a hotel in New Mexico while my husband was doing work there at the military base. I literally almost dropped the phone. I thought I'd stop breathing and probably did for a moment. I had been waiting for this call for a few days and the results were far scarier than I imagined. I knew he was allergic to some things after already experiencing anaphylaxis with some of the new foods he tried as an infant. His eczema was so severe that he had blisters from head to toe. I was still nursing him at the time and realized I had to cut out all of those things from my diet as well. I didn't know where to start or what to do. I had fallen to my knees in desperation for help. 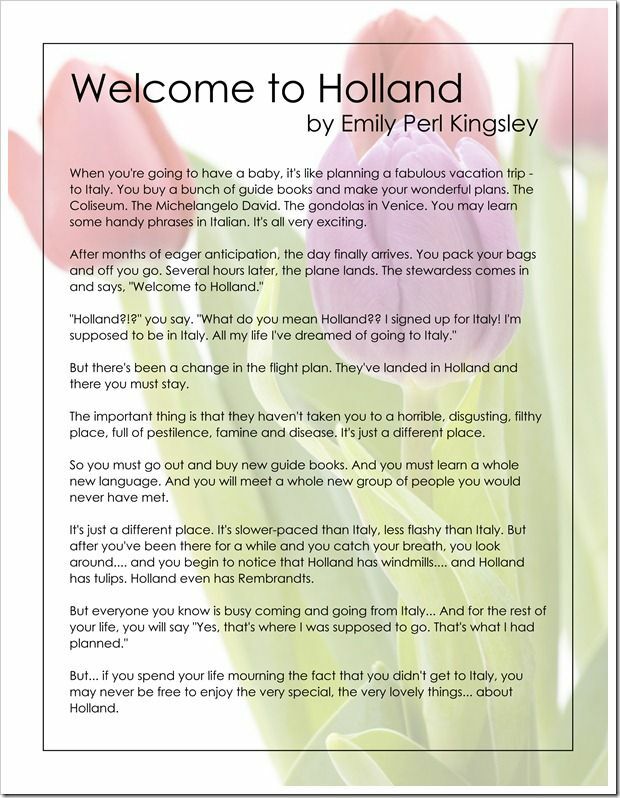 Little did I know that I had entered in to Holland. Even though this was nearly five years ago and we have since had a daughter experiencing the same issues, I have learned so much. I bought books, read articles online, talked with other people, and learned a whole new way to cook. Even the market for gluten free, dairy free, nut free, and so on has grown tremendously helping us out quite a bit. This journey has been difficult at times but so wonderful too. Our family has learned so much about ourselves, other people, and it has even brought us closer to God. When we entered into Holland, we found a beauty there. Our children who have not suffered from any of it have learned to have a bigger heart towards those with medical needs. The two that do suffer from it daily have shown a bravery bigger than I could ever imagine. This journey has had some pretty rough points but amazing happenings as well. 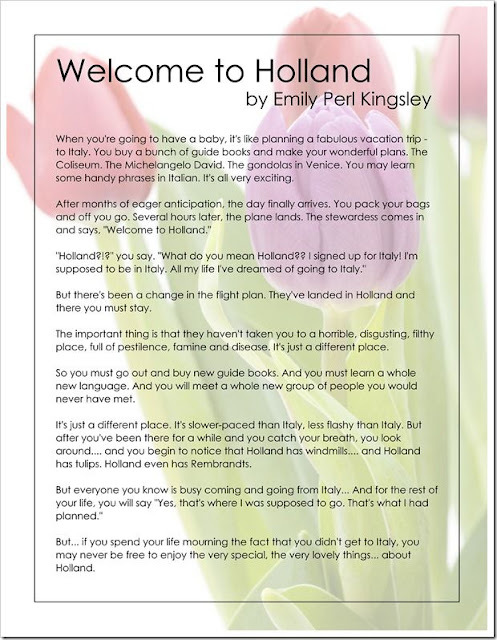 Though I only hope they will be cured someday, I see the world differently since we stepped foot into Holland. 2 Timothy 1:7 For God has not given us a spirit of fear and timidity, but gives us power, love, and self-discipline. Do you remember that show called Fear Factor where the contestants would try to prove who was the fearless one? They would be given tasks to eat some sort of disgusting case of bugs or they would have to be strung over a canyon and glide through the air on a zip line. I remember watching it a couple of times and thinking that I could never do those things. But where does our fear come from? Does it come from being scared of doing crazy things? Does it happen when we are afraid of what others think of ourselves? Do we have concern over the future? Are we afraid of going through something again? Do we fear the world more than we fear God? Yet, shouldn't I put my trust completely in God instead of the thoughts being spoken into my mind by the enemy? I think back to times as a teenager when my fear wasn't so strong. I took way more risks and felt less worried. It seems like the further in life I got, the more my fears developed in regards to various areas. Yet at the same time, I think of how much courage I've gained in other areas such as all the times we moved with the military and having to start over in a new community. I gave birth six times and once to multiples. I used to be tremendously scared of bugs and now I can squash anything. I faced fears in all sorts of ways that have given new courage over time. 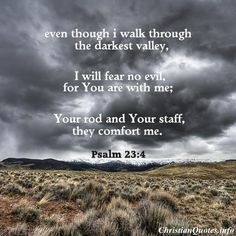 I love what David says in the book of Psalm 23. When we walk through the darkest valleys, God is still there. I don't need to fear what's to come or the outcome of a situation because my Shepard can lead me to peace. David reminds us that God is with us. The two verses that follows says, "You prepare a table before me in the presence of my enemies. You anoint my head with oil; my cup overflows. Surely goodness and mercy will follow me all the days of my life and I will dwell in the house of my Lord forever." Isn't that a beautiful thought? He's already prepared a place for us and only good will come in our future when we continue to fear God. We get to dwell in HIS house forever. Wow! Won't that be amazing? What sorts of things do you fear? Are there any fears that you've overcome? Have you developed any new, recent fears? I have joined in at www.katemotaung.com and the #FMF community. Each week, we are given a word prompt and then we write for five minutes (in my case, usually longer). Then we link up and share what we've come up with. Do you have a blog? If so, come join the fun! Although it may not be intended to come across this way, meaningful advice isn't always so meaningful. Sometimes, I think as women it's so easy to think we are being helpful with our words when really it causes the person on the receiving end to feel worse. Here's an example for you. Accidents happen, as in my case with my food allergy son consuming milk. There have been so many times since this latest reaction where I think of how I could have done this or that differently. But that's the thing, whether it's an accident or something tragic that happens, it wasn't planned by any means. We have to be careful with the words that follow a traumatic event. Whether we mean to help or not, the person(s) going through whatever has happened already knows how things could have been different. If it's an accident, they already know how it could have been avoided and feel tremendous guilt concerning the event. If it's a mother who suffered a miscarriage, they already know deep down that it happened for a reason. If someone just lost another person in their life, they already know it was part of God's plan. If it's an everyday life situation, like a woman raising her child(ren) or an overweight person experiencing health issues, they already know how they want to do things in most cases. What they want to hear is that everything will be okay. What they want to hear is that they are loved. What they want to know is that they can keep on moving forward. What they don't want to hear is the unwanted advice on how their child will sleep better when they never asked for that advice. What the person experiencing a job loss doesn't want to hear is how it must have happened so they could get a better job. What the person who is experiencing major health issues doesn't want to hear is how they can change it, especially if your health is good. I've been there as I'm sure many of us have where we offer words that sting the receiving end more than encourage. I remember a time when someone dear to me shared about some health problems they had and I immediately jumped in with how I would fix it and what they could do. Was it really necessary? Was that really helpful? What they wanted was a listening ear not an interrupting know-it-all. Mostly, what the person wants to hear is how you love them no matter what. They want a hug and an ear ready to patiently hear when they are ready to talk about it. And you can pray with them and for them. More importantly, we must be careful that what we say doesn't come out because of our natural tendency to compare. When we compare ourselves, which many of us do, the words that come out because of it can do more harm than good. Because of this, we think by speaking, it will make us feel better about ourselves. But does it? It's as if we think if we were in their shoes, we wouldn't have let ourselves get that way. We think we are in better health so we can offer the other person advice on their health that we brought up. We think we could have handled a situation better so we tell them how it should have been done. We feel we are doing well financially and over cross the boundaries with our financial advice. Our words may be meant to help or they may be meant to help us feel better about ourselves. Either way, we truly have to be slow to speak. We have to really think and carefully assess the situation before giving away advice to another. Just when we think we've had enough, it gets harder. Things can sometimes be more difficult than we can handle. But this is the time we cling to God the hardest. This is the testing of our faith meant to make us stronger. 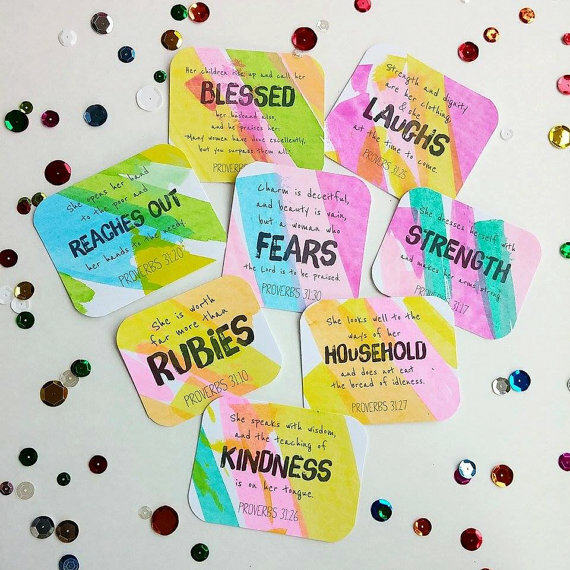 These are the moments we can also see the ways God works in our lives. My son had a major scare over the weekend after consuming milk by accident. He is deathly allergic to milk. Immediately, his lips swelled, he was drooling all over, and having a difficult time breathing. I gave him an Epipen, called 911, and frantically sent my children to look for a neighbor to watch them as we prepared to leave in an ambulance. Have I mentioned we've just moved to this town from several states away only two weeks ago? Did I also mention that my husband was away with work? Even more, we don't really know the area yet or people either as we've just been getting settled. The ambulance arrived within 3 minutes of the call. My son was still having a difficult time breathing so they loaded the two of us into the ambulance. They gave him another Epipen and several rounds of steroids. A lady in between college was home across the street and dropped everything to care for my other five children. It was scary as I held my son hoping he would be okay. They got him right in and loaded him with more steroids, Benadryl, and Zantac. He was monitored until late into the night. The neighbor stayed with our children and when we left, her mother brought us home from the hospital. Now here are the amazing parts of the story. The neighbor mother who drove us home from the hospital happened to stop by our house just two hours prior to the incident. She told me she had been wanting to come meet us, but that day specifically, God was nudging her to come at once. Her daughter whom watched our children had waved to us just days before as we both were getting mail from our mailboxes and exchanged simple words of greetings. That was the first house I sent my eldest to as we prepared to leave. They were a God-send and afterwards, we found out we shared more things in common (husbands having the same jobs, both having children with severe allergies, etc.) which made the situation that much more interesting. One of the nurses who cared for my son was from the exact same hometown as me which is all the way on the other side of the U.S. Another neighbor lady ran to our home to check and make sure our children were okay. It appears we picked an excellent neighborhood to move to here. Every person involved was extremely helpful, caring, and kind. Now for my children, my oldest two were so brave. My oldest son never hesitated for a minute in going out to find help from a neighbor. My oldest daughter noticed what had happened and to be even more sure ate out of the cereal bowl that had the coconut milk in it to find out if my allergic son had indeed mixed the bowls up. She got me immediately as I was in another room. I was amazed at how quickly she reacted by trying a bite out of her siblings bowl which would usually be too "germy" and running to get me. My middle two are the two who have the severe food allergies. These two have dealt with some pretty traumatizing experiences in their lives so far. My son was so brave in going through it and my daughter who relates to this was equally brave/concerned for him. The next morning when she woke up, she was so worried for him. Thankfully, the twins had just fallen asleep for the night as this all happened and didn't know what was going on. They were fine through the whole situation. I feel like I am still processing all that happened. This was not the first time this has happened although the seriousness of it hasn't been this much since the middle two did a food challenge nearly three years ago at UCLA. We are re-grouping, as my husband likes to say, and buckling up the rules tighter on how we go about food in our home. Generally, we are pretty strict about it. The case with this one happened so fast where one child got up from the table when another did. My son sat back down at the wrong place setting and took a bite out of the wrong bowl. It was a moment where I happened to be out of the room. It was a pretty horrifying experience and yet, the results could have been worse. It was really hard knowing I didn't have my husband or family close by. It was hard seeing my son that way and realizing this very well is going to be a way of life for him forever. Nonetheless, I am thankful for a God who kept everyone okay throughout the whole night. To God be the glory great things He has done. Sometimes I feel like the weight of the world is on my shoulders. Two of my children are fighting a daily battle with severe eczema and food allergies that some of the top doctors in the country cannot find ideas for their relief. Day and night, they come to me crying their hearts out while scratching and bleeding over every inch of their entire bodies. It not only hurts them but it hurts me. Nothing I do can take the misery away from them. Not even for a short time will it really disappear. They rarely sleep through the night without waking up screaming in agony for more medicine. During the daytime, we stop frequently with whatever we are doing to moisturize them as best we can when they fall to the floor to itch and cry. Because of their condition, their lives are far from normal. They have to stay as bottled up in our safe environment with certain temperatures, scent-free enclosures, while serving specific foods that won't kill them. When we do enter the world, people look at them with fear as though they carry the chicken pox or some other undesirable disease. It's always pointed out and my son looks down to the floor with a face of embarrassment over what he feels to be abnormal. It breaks my heart. We've tried EVERY over-the-counter, prescription, and natural medication out there for them. It still stings. It still hurts. The pain still lingers on. The itch will not go away. They are miserable and have felt it every day of their life. Many a nights I have cried myself to sleep. I have poured out my heart and prayed for some kind of relief... any kind of relief. My soul cries out to Him wishing for things to get better. I know He hears me and I know He wants the best for my children. I have prayed and cried to God wandering why the length of their suffering has to exist. We are all fighting a battle. This battle can range from illness, disease, chronic pain, depression, acceptance, fear, and more. We can't give up. God hears our every cry, sees our every tear, and knows our every thought. The suffering we face from the dynamics of life can go two ways. It can either break us till we fall or carry us to Him. We have to make a choice. Do we choose to trust in Him? Or do we give up? If we know that He has a purpose for us, whether we see it or not, we can move forward. My tears may continue to fall at night when I hit the pillow. But His tears for what the world has done while turning our backs on Him are much bigger. I can get through this only with Him and I can keep praying for a miracle.